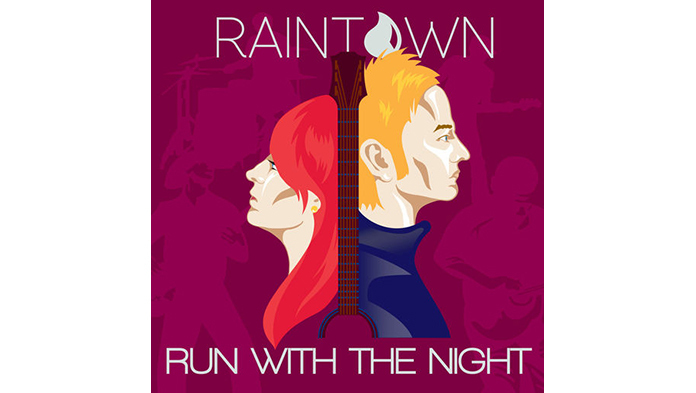 It’s an exciting day for us here at Raintown HQ - we have a brand new single dropping today called ‘RUN WITH THE NIGHT’. Oh, we really hope you like it. We know there was no huge build up to this release and in truth, we wanted it out earlier this year, best-laid plans and all that. This track was our first working with uber-successful songwriter & Producer, John McLaughlin, who has written and produced 7 UK No.1’s and more than 25 Top Ten hits worldwide. It’s an unbelievable track record; his passion for songwriting and production in unabated as well as infectious. We are really grateful for the opportunity to work with him. It is an upbeat track, that we hope will have you singing the chorus for days. Well, that’s the hope - either way we would love to hear your thoughts. We wrote RUN WITH THE NIGHT after a long chat; late one night - just after Alba-Rose eventually fell asleep. The norm in our house now. We got talking about taking chances and whether people are more or less inclined to risk it all these days -whether they would stay safe or run with the night. It was the catalyst for the upcoming six-date tour of the UK and now a further 3 dates in June. See here for tour dates. The industry people who have heard the track are being super positive about it and that is awesome, but we would really love to hear from you and your feedback. As with much in this ever-changing business, the way we fund projects has to evolve and for RUN WITH THE NIGHT we were would like to extend our sincere gratitude to ‘Mutch Better Foods Ltd’ who have sponsored this single. We hope you love the track and would love to have your support on the next stage of the Raintown journey.